on January 15, 2019, 4:11 p.m. 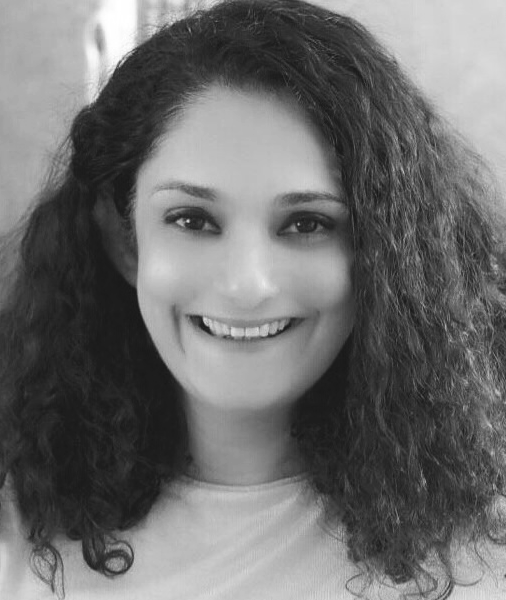 Since we all spend a large time of our day online on our phones and use multiple social media platforms to stay connected, it was only natural to see what kind of New Year’s resolutions do Indians make with regards to their social media lives. Fake news is a hotly debated topic worldwide as well as in India. In the recent times, WhatsApp has emerged as one of the fastest and most common sources of spreading fake news. With the 2019 general elections around the corner, the frequency of fake news is expected to rise. But what would be interesting to see is whether Indians consider this to be a menace and the manner in which they respond to such hoaxes. From all the apps present in the social universe, WhatsApp emerged as the most commonly found app on people’s phones, followed by Facebook. A higher percentage of men are more likely to have Facebook app on their phones compared to women (90% vs 82%). Not only is WhatsApp the most commonly found app on people’s phones, but it also is the most actively used app. Comparatively, it is most actively used by those who are over 30 years of age (66%) than those under 30 (49%). It is also interesting to note; that women are more indulgent on WhatsApp than men (62% vs 56%). This stands true across all age groups. Naturally, ‘WhatsApp addiction’ emerged as the winner when asked what addiction people think they have or could have in future. This was followed by ‘Phone addiction’ (37%) and ‘Facebook addiction’ (31%). WhatsApp addiction is the strongest among 30+ year olds (56%), who are also the most active users of the service. While for the younger generation under 30 years of age, phone addiction stands ahead of WhatsApp addiction (42% vs 38%), for the 30+ generation, WhatsApp and Facebook addiction surpasses their addiction to phone. With respect to their phones, top new year resolutions that people are most likely to make in 2019 are ‘I will not check my phone during my meals’ (37%), ‘I will not check my phone while driving’ (35%), ‘I will not check my phone every few minutes’ (34%) and ‘I will not sleep with my phone next to me’ (34%). 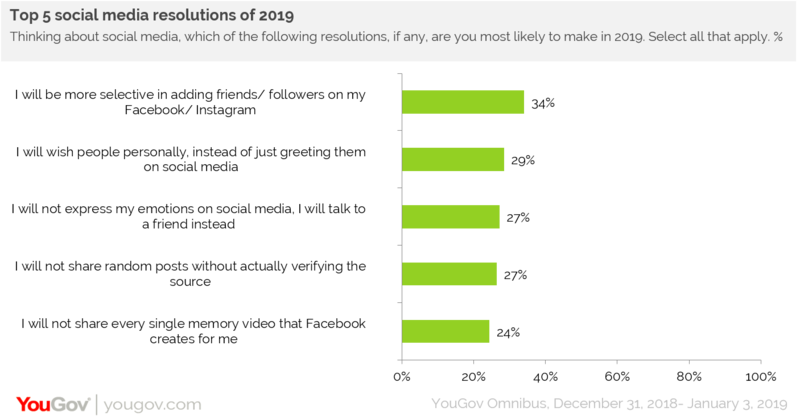 Talking about social media resolutions, a little over a third (34%) said they will be more selective in adding friends on Facebook or Instagram. Close to 30% also admitted to wishing people personally rather than on social media, not expressing their emotions on social media and not sharing random posts without actually verifying the source of information. 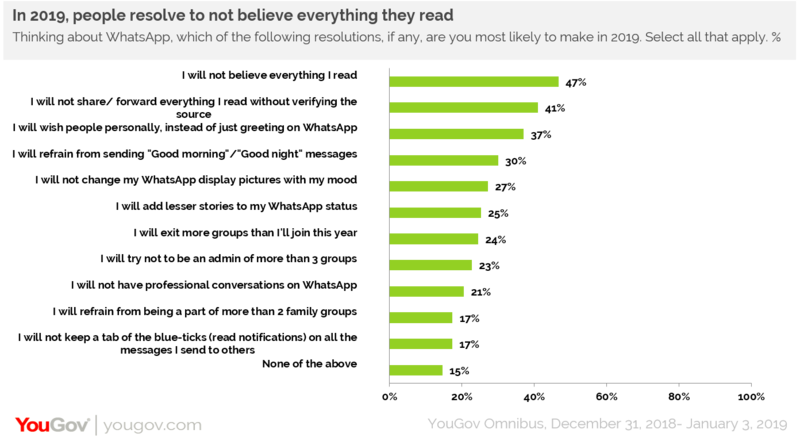 When speaking specifically about messaging app, WhatsApp, most respondents claimed to make this resolution in 2019 – ‘I will not believe everything I read’. This speaks of the people’s resistance towards fake news and random forwards and the effort they are likely to make in this regard. This view is further reinforced with 41% claiming to not forward messages without verifying the source of information. Apart from this, people have also demonstrated an intent to take a more personal approach in greeting people, instead of wishing them on WhatsApp. These sentiments have come out in their social media resolutions as well. Lastly, when asked about the social media app that respondents are most likely to remove/deactivate in 2019, Facebook topped the charts with a fifth of people wanting to remove it from their lives. It seems like Facebook’s popularity may be on the decline. Although most people have the app on their phones, only 1 in 5 people are actively using the app.